The first half of our move to Massachusetts went pretty smoothly. Although it was apparently pretty busy, because I managed this one photo, and that appears to be about it. It is a picture of the living room of the new place, before we started filling it with stacks of boxes. As you can see, the floors are very shiny, which tells you that my children do not yet actually live there. But soon. In the meantime, we have a big weekend coming up back here in Vermont. Dan is graduating from medical school on Sunday, an event worthy of my waxing philosophical at least a little bit. But right at this moment I am typing with one hand while trying to both nurse the baby and eat a sunny side up egg. This is actually pretty tricky business. So thoughts on the medical school journey later, I guess. By the way, I made you all some printable and pocket-sized lists for summer library going. Fun, yes? You can find them over at Playful Learning. Sneak Peek: Learning Through Play Spring Book Bundle! Some of you might remember the ebook sale organized by Melitsa of Raising Playful Tots and Cathy of NurtureStore last fall. It was incredibly fun to be a small part of the whole affair; I had a chance to meet other writers, and to be a part of a really cool and innovative group of creative teachers, authors and parents. Cathy and Melitsa have now organized an even bigger book bundle for the spring season, and it will be availabe through the blogs of the individual participants beginning this coming Monday morning. The Spring Learning Through Play book bundle will be available April 8th to April 14th only, so you'll definitely want to pop back in next week and download your copy. I'm just having a chance to look through everything that is included myself, and I'm amazed at the amount of great stuff inside. The interwebs are full of awesome folks if you just know where to find them! This special bundle of books is available for you to buy only between April 8th and April 14th. I’ve read the books (and written one of them!) and I’m so happy to recommend this offer to you. These ladies really know their stuff and the books and resources are packed full of fantastic creative and practical ideas that you can use with your children. There are sixteen different authors joining in, bringing you over $130 worth of resources. And, guess what – you can buy the lot for just $9.99! Read on to see all the items included in the spring special offer – and start looking forward to getting your copies! Playful Learning and Birdwatching with Kids. It would seem that I never got around to writing the post that I had intended to today. The sun was shining and the baby declined his regularly scheduled nap, so it seemed to make good sense to abandon our various household responsibilities in favor of hitting the trail. We spent our afternoon trudging through the mud and snow on a favorite local hike, and the housework and the blogging? Not so much. But there is always tomorrow, I suppose. I did want to stop by just for a moment, however, to mention that I have a post up at Playful Learning today. It's a handy little list of ideas for making birdwatching with kiddos an enjoyable prospect, and I think that some of you all might very well like to have a read through. You can find it here. Also, I am woefully behind with responding to comments and emails, mostly due to just having been really busy over the last week or so. But believe you me, I appreciate every last sentiment that you send my way, and I will try very hard to get caught up this week. Pinky swear. 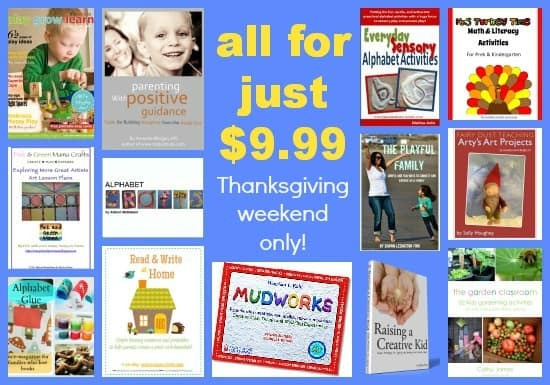 The Super Duper Thanksgiving Weekend E-Book Bundle! Good news for those of you looking for distractions to keep you from getting started on the mashed potatoes too early: The Thanksgiving Weekend E-Book Bundle is available now! I had some confusion inititally about when to open this up for purchasing, because as you all know, I am a Permananetly Confused Person due to the care and feeding of small people and the associated lack of sleep. But it looks like it is okay to let you all go ahead and download now! There are e-books and downloadable magazines from thirteen different authors, including everything from hands-on activities, crafts and printables to mindful parenting resources. Very good stuff. A note about mobile devices: it doesn't appear to work to download the bundle from a phone, so you'll want to have access to a computer when you download. Also, if you would like to send the bundle to someone as a gift, simply purchase as usual, and then forward the email from e-junkie with the download link inside to the recipient of your choice. The time for the bundle has come and gone friends... But, hey! Don't worry- you can certainly still find the individual books included by visiting the author's sites through the links below. This special bundle of books will be available for you to buy only over the Thanksgiving weekend. You will have from Wednesday, November 21st, 2012 until midnight (GMT) on Monday, November 26th, 2012 to buy this special offer. And really - you'll want to! These ladies really know their stuff and the books and resources are packed full of fantastic creative (and practical) ideas that you can use with your children. There are thirteen different authors joining in, bringing you over $100 worth of resources. And, guess what - you can buy the lot for just $9.99! Read on to see all the items included in the Thanksgiving weekend special offer. It isn't so much a question of what we did around here last weekend as it is what we didn't do. Goodness, what a busy couple of days we had. But busy in all the nicest ways, really. We welcomed Dan home from a trip out west, Mariam had her first orchestra concert of the year, we had friends for dinner on Saturday night and stayed up far later than we probably should have. Our friend Matt came into town from California on Sunday, and though he is here for work-related purposes, we took advantage of the free time that he did have and went for an afternoon walk down to a favorite beach on Shelburne Bay. We filled our pockets with especially lovely rocks and searched for beach glass by the shore. Annie 2.0 found some kind of crayfish-type fellow. He was long dead, but still in very servicable condition for observation and investigation. Mariam received some solid instruction on the fine art of rock skipping from Matt, Mark and Annie 2.0. She is already a much better rock skipper than I will ever be. I consider that good news. The skipping of stones, after all, is one of the more satisfying idle-time activities available out there in the wide world. :: Mariah lives in an area where the recent storm caused significant damage to many, many communities. She is generously donating all proceeds from Playful Learning e-courses through the end of this coming weekend to the recovery efforts, and you can find out more about how to sign up here. :: David and Lisabeth have a free Thanksgiving-themed Sparkle Story up on the Sparkle site and are also offering a special Martin and Sylvia sample pack all week long with proceeds going to Heifer International. Heifer is an amazing organization, and we always love Martin and Sylvia around here! Check out the details and find the free story here. One of the things that I find particularly endearing about children is the fact that they are such natural collectors of unexpected and unusual treasures. To those below a certain age, a piece of beach glass or a perfectly round stone is as much a prize as one is apt to find. Okay, I suppose that is also true of some people above a certain age as well. Ahem. Mariam has always been a collector; of acorns, rocks, feathers and other odd bits of nature. I mentioned in my post for Playful Learning that part of our organization of her new project area was hanging some shadow box-like shelves to house a few of her collections. I've had a handful of questions about the shelves, so I thought I might tell you a bit more about them since I didn't get specific in the original post. The shelves do look a bit like shadowboxes, but really are just deep, cube shaped shelves. I actually got them years ago, probably with an entirely different purpose in mind, and they have just been hanging around the garage, unused since then. I think that they are these. When I wanted somwhere to tuck Mariam's little collections away that was both easy for her to see and safe from the perpetually naughty cat, they seemed like a perfect solution. The shelves are open to the wall at the back, but I felt like they needed a backing of some kind. I cut pieces of scrapbooking paper to size, and then glued the pieces on to the backs of the shelves to create a colorful background. I suspect it would be quite easy to change the paper out for new, which would be a super simple like magic way to make it look like the shelves themselves were new and different. The collection shelves aren't quite as clean and pretty now as they were then they first went up a few weeks ago. Indeed, those tiny mineral jars now have a number of companion treasures nestled on all sides of them. Shells found at the lake, more beach glass, a blue jay feather, the shell from a quail egg. And even if this means that things are getting a bit crowded, it still seems fitting. If beauty is in the eye of the beholder, then it makes good sense to put your favorite finds where family and friends can behold them too, no? Also recommended: keep a pocket magnifying glass on one of the shelves or somewhere nearby to make for extra easy examination of the collection. I realized this week that September is already half way over! Seems like a good time to offer a deal on last September's issue of Alphabet Glue. Between now and September 21st, get a free copy of Volume Three (story maps, story buntings, reference books for kids and more) when you download a copy of Volume Six, Seven or Eight. Tell a friend! Playful Learning and Recycled Art Treasure Boxes. Do you know one thing that I like very much? When I finally get to let you all in on a secret project that I've been working on behind the scenes, that's what. I am therefore delighted to report that today you can read my very first post as an official and regular contributor to Mariah's awesome website, Playful Learning. I'll be posting over there a couple of times a month, and I'll be sure to let you know when there is something new there that you might like to check out. My first post is a Glue-style tutorial for making origami boxes out of recyled artwork. You can find it here. They are perfect for the stashing and safekeeping of tiny summer treasures and I think that you will like them very much. Make one, make a dozen, and, if you feel so inclined, perhaps you would pin the tutorial on Pinterest or share it via Twitter or Facebook? It's always nice to get a new project started off on just the right foot, if you know what I mean. In other news, our friends at Sparkle Stories have a free story available in honor of Father's Day. Click here to have a listen.